3) Please join the TeamSpeak server, you will be required to listen to others. 4) It is preferred that you do speak for this event, but it is not essential. 5) Lets have some fun! If you have a card pack that you want to include please say it in your post. When we play CAH, I will give you a link to the game where you enter your TeamSpeak name so you can join. I usually do it, I didn't do it this time, randoom did, i appologise to the idiots that think it was me. I promise i no more play stupid sounds in ts. I am looking for different options of games to play in new events or whatever so what games do you guys like to play in your free time? And would you want to see an event with this game? Hey guys, I've been watching this youtube channel and sounds like a lot of fun happens here ^^ So here I am, french metalhead, I stunt since SA:MP and always enjoyed those kind of events... So, cant wait to play! it's nice things seems well organized here btw I play on PC, and my nick is the same on socialclub and steam so feel free to add me. For those who don't know me, I've been pretty much dead on the forums since Office Riot Forums became NGG a few years ago. I have some kind of big nostalgia concerning BJ's old forum, the good old BonergamesForums back when I first joined in 2010. I need a new keyboard (probably) because I was a retard and spilt some Fanta over it. Before you start with the comments stating how stupid I am (i know) please suggest some of your guys' favourite keyboards and what you would suggest for me to get. it must be from a reputable company like Razer etc. Thank you for stopping by, have a good day. Schedule: A-team themed event! Please bring the proper costumes and vehicle! Read the entire topic or risk being kicked! This event will have an A-Team/Mr. T theme! If you are not familiar with the A-team or Mr. T, GOOGLE IT! 1. Mr. T costume contest: You will need to make a black character, and make them look as similar to Mr. T as possible! If you don't do this, you cannot join the contest! Winner gets a very cheap Steam game! Mr. T appeared in many different ways. Google it and choose a Mr. T style and try to re-create it to the best of your abilities. You will also be expected to do a brief impersonation of Mr. T.
2. 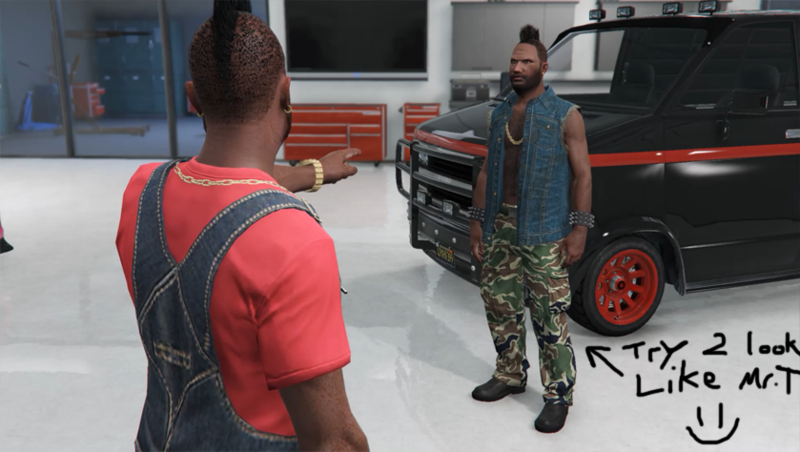 Mr. T squad shenanigans: This will be like Raccoon Squad, but we will all be dressed as Mr. T and go around bugging random players in public sessions. Please have this exact outfit saved! If you can afford it, please purchase a "Gang Burrito" and make it look like the one in the picture! 3. 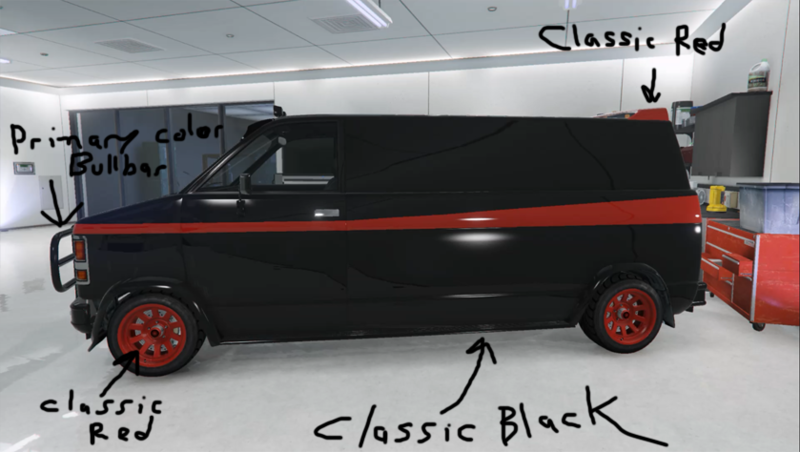 A-team Van Race: If you do not have a gang burrito with the appropriate colors and modifications, you will not be invited to the race/races. 1. 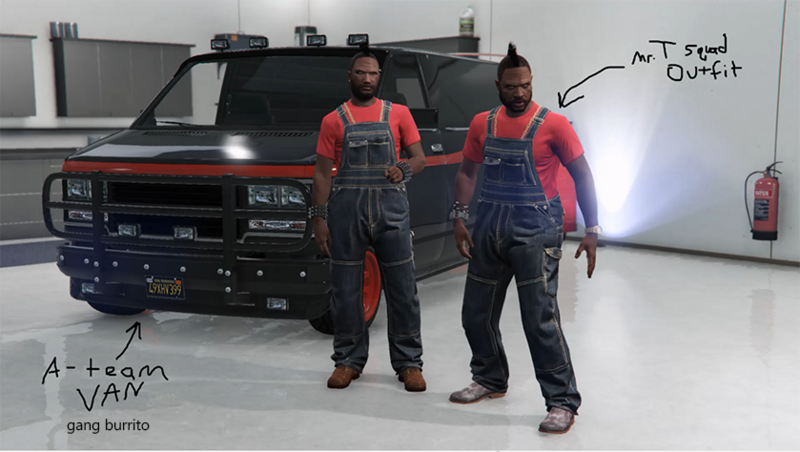 2 Mr. T outfits saved. One specified above for the "Mr. T squad" shenanigans, and another for the costume contest. 2. A Gang Burrito modified to the A-Team van style.